Today an artistic and a medical advance which helped develop their concerned fields. 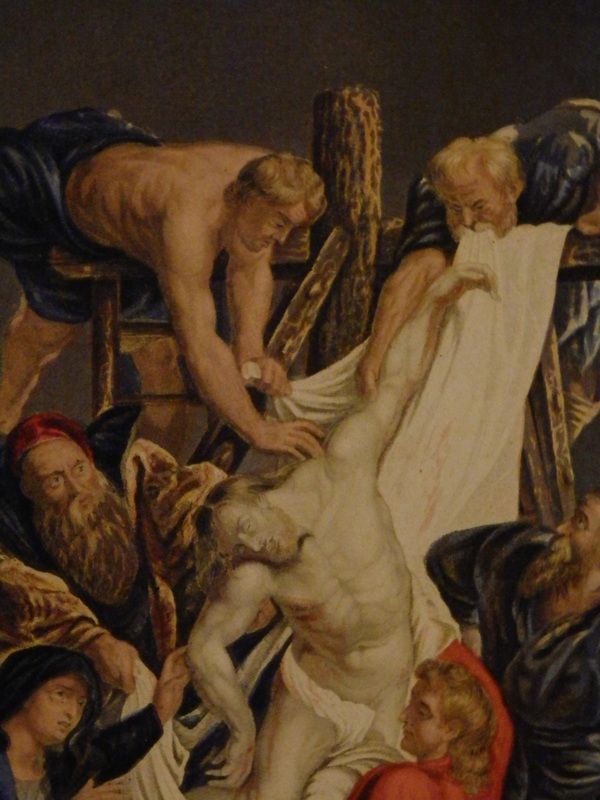 We begin with #DescentfromtheCross. A colour print by #GeorgeBaxter. Most of us would not recognise his name but we possibly should. George Baxter developed/advanced the art of coloured printing. Baxter prepared a main or ‘key’ plate, usually steel, using any combination of engraving, stipple, etching and aquatint. The key plate provided the main lines of the image and much of the tone, light and shade. It was usually printed in a neutral tone, such as light grey or terracotta. Often Baxter used more than one colour to ink the key plate – for example, to gradate the image from blue in the sky, to buff in the middle distance and to a darker colour in the foreground. Following the printing of the key plate, relief blocks were prepared, usually from wood, zinc or copper, using impressions of the key plate to create the blocks. Usually one block was prepared for each colour, although sometimes two or more colours or tints were included on the same block, requiring hand inking of each individual area. Each colour was applied and allowed to dry before adding the next colour. It is thought that Baxter usually started printing with a blue tint and then progressed through the other colours in a predetermined order – all blocks were numbered sequentially and labelled with the colour to be used. Sometimes up to 24 separate colours were used, although ten could be considered an average number. Baxter achieved his precise registration by fixing the print over a number of spikes, over which the blocks would also fit. 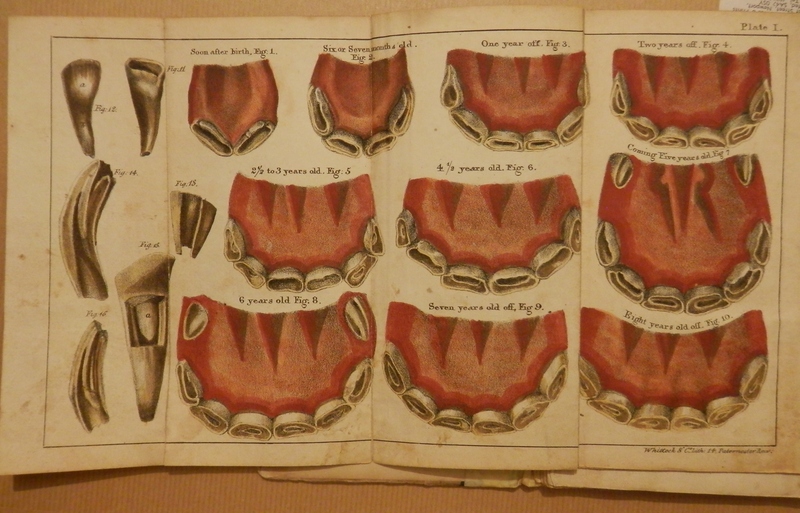 The image on the left is thought to be Baxter’s finest coloured print. We go to a translation of a treatise by M Girard, Director of the Royal Veterinary School at Alfort. The translation is by T Irwin Ganly. This publication from 1829 was to prove most helpful for all veterinarians, breeders, farmers, and all others who worked with horses. For up to that time no definitive work had been done on horses age past its working prime of 8 years in age. One really should know if you’re buying a horse which is ten years old or eighteen. 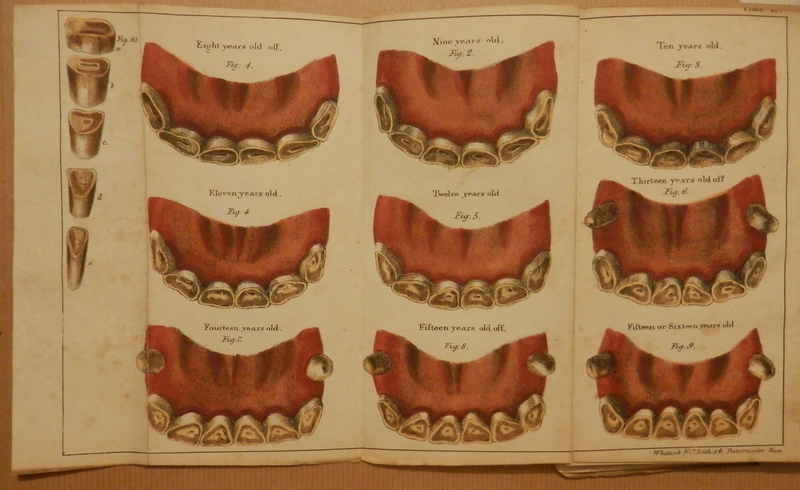 From my 1829 first edition I give you the two plates describing the teeth of a horse. 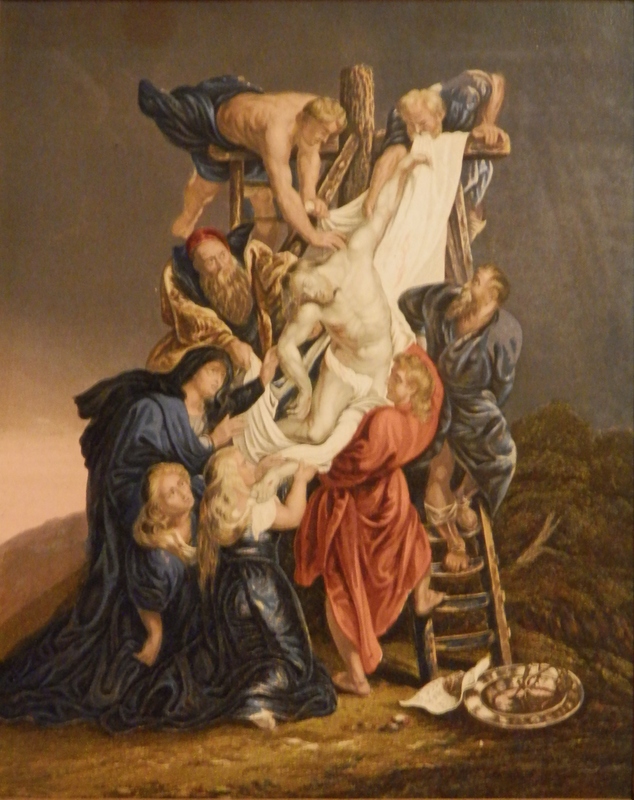 This entry was posted in Etching, Lino/woodcuts, Lithographs, Mezzotint and tagged cross, disciples, horse, incisor, jaw, Jesus, ladder, Martha, Mary, nippers, teeth, thorns, tushes. Bookmark the permalink.